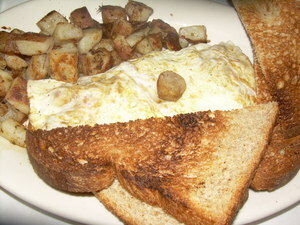 About six months ago, Andy and I tried the new breakfast joint on Wickenden, The Blue Elephant. As a summary- we loved the atmosphere, the menu was fun, the service was great, but the food was just okay. I promised to return again after the restaurant had some time to settle in (the first time we went was only two weeks after they had opened). So, last weekend, Andy and I decided it was time for our second brunch at The Blue Elephant. 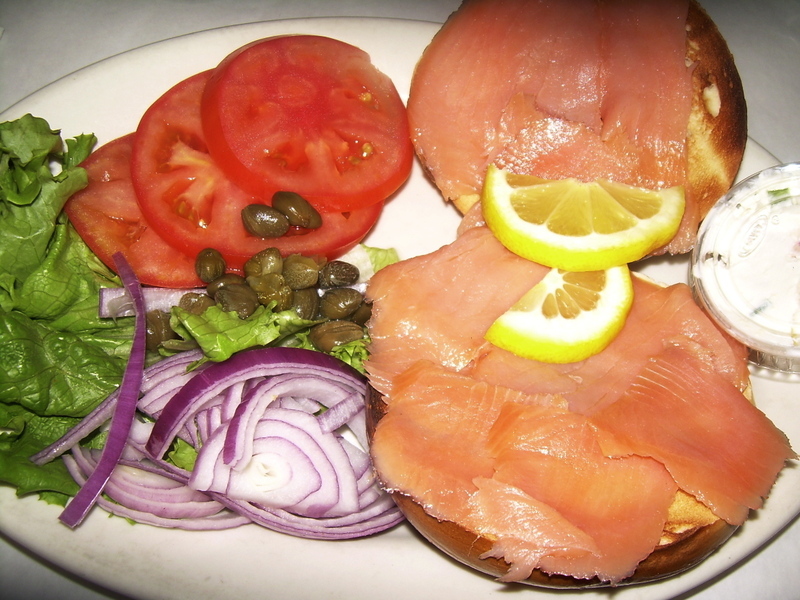 The lox were delicious, as was the chive and red onion cream cheese served on the side. But the bagel- presumably the most important element to this brunch platter- was not good at all. It was stale, and even toasted the bagel was tough and tasteless. I do not know where they get their bagels from, but I wish I would have asked so maybe I could have made a suggestion. I didn't actually realize what a colorless plate this was, but the inside of the omelette was certainly prettier. Andy felt the same way about his omelette as I felt about my bagel- some aspects were good, and others fell a little flat. Luckily, brunch at The Blue Elephant isn't a bank breaker- so it is easier to be satisfied with some of the so-so aspects of the meal. All in all, we left feeling the same way as the first time: we loved the atmosphere, the menu was fun, the service was great, but the food was just okay.